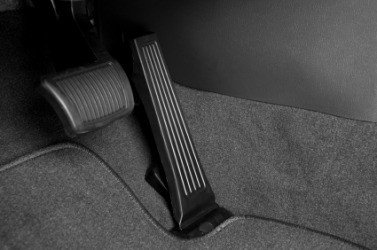 This cars brake pedal is the one on the left. The definition of a brake is a device used to slow down or stop a vehicle or machine. An example of brake is the device in your car that slows down or stops its movement forward. To brake is to slow or stop by pressing on a pedal that cuts off movement. An example of brake is when you step on the pedal in your car that is next to the gas pedal in order to slow down or stop your car. "brake." YourDictionary, n.d. Web. 17 April 2019. <https://www.yourdictionary.com/bRAKE>. A device for slowing or stopping motion, as of a vehicle, especially by contact friction. Something that slows or stops action. To reduce the speed of with or as if with a brake. To operate or apply a brake. To be slowed or stopped by or as if by the operation of a brake. Early Modern English brake bridle, curb (for a horse) perhaps from Middle Dutch or Middle Low German nose ring, curb, flax brake ; see brake 2. A toothed device for crushing and beating flax or hemp. A heavy harrow for breaking clods of earth. An apparatus for kneading large amounts of dough. A machine for bending and folding sheet metal. To crush (flax or hemp) in a toothed device. To break up (clods of earth) with a harrow. Middle English from Middle Dutch from Middle Low German; see bhreg- in Indo-European roots. A lever or handle on a machine such as a pump. Middle English from Old French brac from oblique form of bras arm ; see bracer 2. Any of certain other ferns, such as bracken. Middle English probably back-formation from braken ; see bracken . An area overgrown with dense brushwood, briers, and undergrowth; a thicket. Middle English from Middle Low German; see bhreg- in Indo-European roots. A high horse-drawn carriage with four wheels. Compare Middle Low German brake. A large, heavy harrow for breaking clods after ploughing; a drag. (chiefly nautical) The handle of a pump. (engineering) An apparatus for testing the power of a steam engine or other motor by weighing the amount of friction that the motor will overcome; a friction brake. (figuratively) Something used to retard or stop some action, process etc. A device used to confine or prevent the motion of an animal. A frame for confining a refractory horse while the smith is shoeing him. An enclosure to restrain cattle, horses, etc. (intransitive) To operate (a) brake(s). (intransitive) To be stopped or slowed (as if) by braking. It is sometimes necessary to use water to keep the brake wheel cool. Out of the corner of his eye, he saw the brake lights of the woman's car as she drove down the driveway. Poncelet (1788-1867) invented a form of Prony brake which automatically adjusted its grip as µ changed, thereby maintaining F constant. This form of brake was also invented independently by J. They are then cut direct from the head and the bark is easily removed by drawing the rods through a bifurcated hand-brake of smooth, well-rounded steel, framed in wood.